Books are important. Books are where we express ourselves, share ideas, record history, and dream about the future. In the age of the internet, hundreds of cable channels, and short attention spans, one has to wonder if books are in danger. Over 60 years ago, perhaps inspired by the censorship and paranoia of the McCarthy era, novelist Ray Bradbury imagined a world in which people were not allowed to read or even possess books, in fact all books were burned. 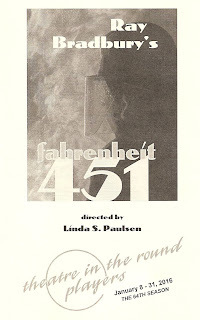 He later adapted his novel Fahrenheit 451 into a play, currently being produced by Theatre in the Round. The themes of censorship, control of information, and the dangers of reality TV ring eerily true as brought to life by this large and talented cast and interesting staging. It makes for a fascinating, disturbing, and thought-provoking evening of theater. 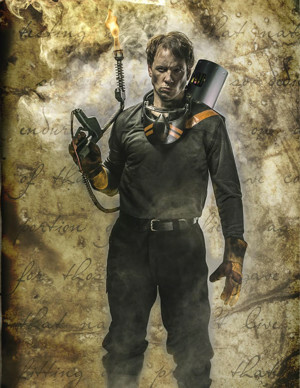 The hero of our story is a fireman named Montag. I do not use the gender neutral term fire fighter because a) this dystopian future still seems to have pretty clearly defined gender roles, and b) firemen do not fight fires, they start them. An alarm goes off at the station, and the firemen take their accelerants and lighters and go off to burn the books that were found. At home, Montag's wife Mildred spends her time watching TV shows that seem specialized to her life. Montag is pretty complacent about his job and his life, not knowing anything different, until he meets a smart and spirited teenager named Clarisse. She gets him thinking by asking him questions, like "are you happy?" When Montag gets his hands on some books, his world is turned upside down, and he seeks out Clarisse's professor grandfather to help him make sense of things. In case you, like me, have never read the book or seen the 1966 movie, I won't spoil the ending for you. But suffice it to say that Montag has an existential crisis as he searches for truth and meaning greater than the life he had been living. As Montag, Bill Williamson gives a natural performance, a likeable everyman in a Bill Paxton sort of way. In contrast, Rod Kliess' Captain Beatty is a bit of a maniac, and it's never quite clear whether he's a good guy or a bad guy. Dani Pazurek is charming as Clarisse, a standout in the large and capable cast that not only portrays multiple characters, but quickly and efficiently moves the set pieces around between scenes. Director Linda S. Paulson effectively manages the size of the cast and the in-the-round staging. Dietrich Poppen has designed interlocking blocks that fit together like Tetris pieces to form different objects. All of the set pieces as well as the multi-level stage have been decoupaged with pages of books. From a distance it looks like a neutral camouflage, until you get up close (which you do as you walk across the in-the-round stage to your seats) and see the pages. The whole effect is really quite striking and futuristic. Completing the look are Jenna Rose Graupmann's costumes - the black and orange fireman uniforms and the women's uniforms of colorful leggings and stark white tops.